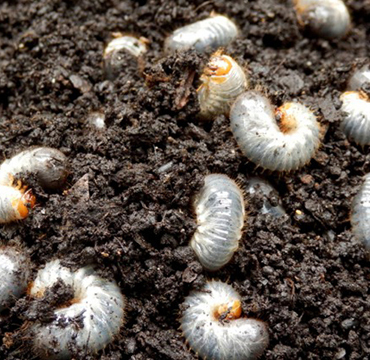 Need help getting rid of lawn grubs from your garden? Here at Lawn & Weed Expert, we provide specialist chafer grub control services for outdoor spaces in Cardiff, Swansea, Newport, and the surrounding areas. Chafer grubs are – fortunately – not a huge problem in South Wales due to the heavier clay soils we have here. However, lawns laid on ground prepared with sand may be prone to damage from chafer grubs; the same goes for gardens in sandy light-soil areas such as Ogmore and Porthcawl. Give us a call today on 0800 111 4958 – we can provide a free, no-obligation survey to assess your lawn grub control requirements. Brown Areas on Lawn Damaged areas can rapidly increase in size as the lawn grubs continue to eat. In some cases, the damage is so great and so rapid that it is possible to lift entire sections of turf off the ground because the grass roots have become completely disconnected. Birds Looking for Food Birds pecking at your turf may mean that you have a chafer grub infestation. The grubs are a popular food source for birds, and even other types of wildlife like foxes and badgers may be interested in feasting on your lawn’s chafer grubs. More Damage in Summer Damage will increase as the chafer grubs grow larger and increase in number over the course of the summer. The lawn grubs prefer sandy soil and will burrow in deeper during periods of cold weather. Keep an eye out for these seasonal patterns. Chafer grub control is relatively simple and inexpensive, but it can be difficult to find a specialist capable of providing it. The appropriate pesticide must be applied by a competent professional, and once applied, is usually fully effective within 72 hours. We at Lawn & Weed Expert have treated numerous lawns for chafer grub damage. Contact us now for assistance.